Track the metrics that matter to your building easily with custom KPIs in your weekly Verdigris email. 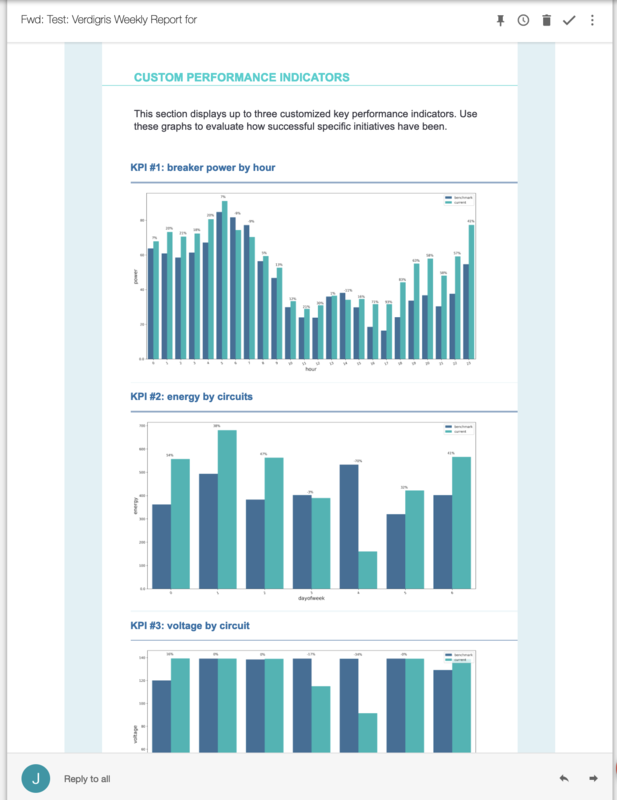 Verdigris makes it easier to save on your building's operations--in that vein we have released weekly custom performance indicators that gives you the information you care about in your inbox every week. • Make sure you are getting the most out of your HVAC and not wasting energy relative to changes in weather. • Check that your key equipment is meeting your energy conservation goals for the month. • Check that the new equipment or retrofit you purchased is reducing energy usage by the amount quoted. Send an email to solutions@verdigris.co with what you would like to monitor so we can set up your custom weekly KPIs today. Verdigris is a leading IoT energy meter that allows you to better manage your buildings and find ways to save energy. We are one of the easiest meters to install and our advanced AI allows us to provide some of the most advanced capabilities at one of the lowest cost per metered circuit.